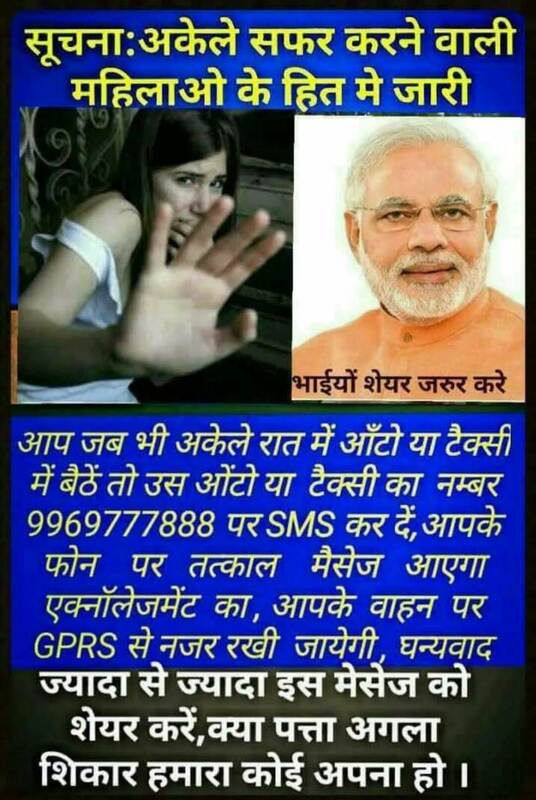 A new SMS Service at 9969777888 Tracks Women Travelers for Safety. 1. Bengaluru city police have started a good service with a dedicated helpline for women. Before boarding the taxi or auto, sms the Vehicle Number to +91-9969777888. You will get an acknowledgment via sms. Vehicle will be tracked via GPRS. Share with as many as you can. Help your sister, mom, your wife and female friends. మరింత మంది ఆడపడుచులకు అందే వరకు పంపించండి ! Various messages circulating widely on social media claim that an SMS Service at 9969777888 Tracks Women Travelers for Safety. 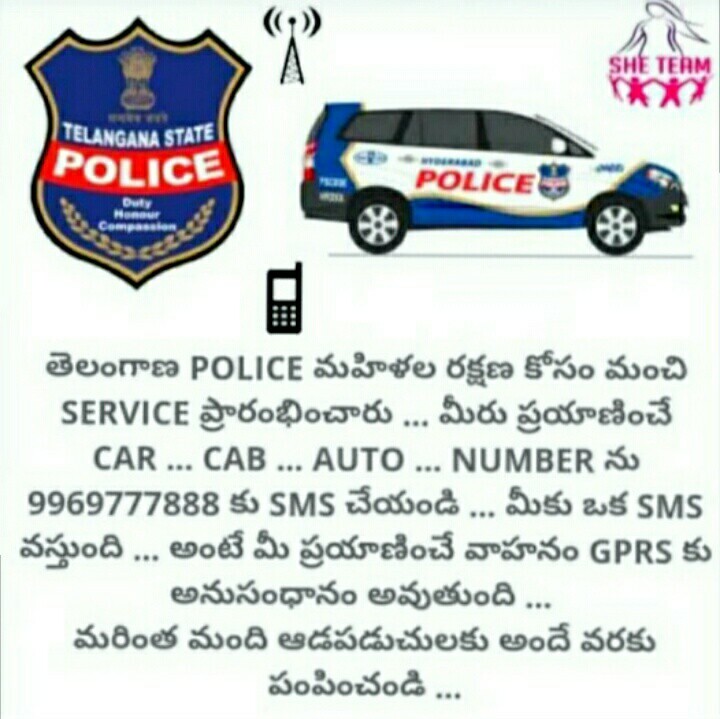 According to them, Telangana police has started a new service under which women traveling in taxis or autos could be tracked using GPRS if they send an SMS to the number 9969777888. Notably, the viral messages on social media platforms also mentioned names of other Indian states like Bangalore, Maharashtra, Delhi and Andhra Pradesh. Although they appear genuine, the claims about the SMS service saying 9969777888 tracks women travelers are not true. The MTNL mobile number 9969777888 was in fact associated with a related women helpline in Mumbai, but the service was later shut down. On 8th March 2014, on the occasion of the International Women’s Day, Mumbai Police launched one such free SMS service to ensure safety of women traveling alone or in odd hours. Under the ‘Travel Safe When Alone’ initiative, any woman before taking an auto rickshaw or taxi could message its registration number to a dedicated helpline number 9969777888. Police used to track the vehicle the woman is taking and would get her location through GPS. Mumbai police launched the service in the backdrop of sexual assault and murder of Andhra Pradesh techie Esther Anuhya. However, they shut down the helpline number later in March 2017 as it did not get good response from women. Good News for Women in Mumbai. Police commissioner Mr Rakesh Maria has started a good service with a dedicated helpline for women when traveling alone by auto or taxi. Before boarding taxi or auto women should send a message of the vehicle registration no to 9969777888. You will get an acknowledgement via sms. The vehicle will be tracked via GPRS. This service is free. Service started by mumbai Police jointly with MTNL. Share with as many you can. Help ur sister, mom ur wife n female friends. Some miscreants changed the name of ‘Mumbai Police’ to ‘Telangana Police’ among others to create a fake ‘social service’ message for circulation. The messages mentioning Telangana police surfaced earlier in 2014 also. Back then, Swathi Lakra, Addl CP (Crime and S.I.T) clarified they did not provide such service. Later in June 2018, Bengaluru City Police also issued a clarification about the fake message floating on WhatsApp. They also warned that stringent action will be taken against the people who create and spread such fake messages on social media.